We invite you into a container that is generously held; by Arjan and Deborah, by the Community, by the sea that surrounds us. We love to create a safe space where depth is welcome and ignite the spark of life. Our Open Floor practice provides us with tools to guide us into profound dances for healing and for celebration, as we end our year together and take our first new steps in loving company. Deborah (vitalmoves.co.uk) has been teaching on this event since 2001 and is delighted to once again be co-teaching with Arjan . They have been dancing and teaching around the globe for over 25 years. 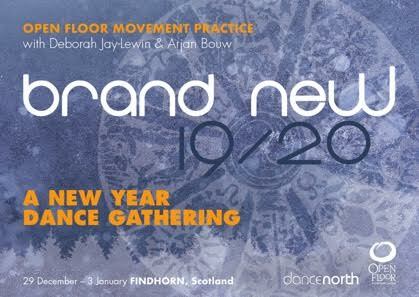 They are excited to bring their love of Open Floor Movement Practice to this New Year gathering and are really looking forward to celebrating in Findhorn with you. The venue for the gathering is the magnificent Universal Hall Arts Centre in the Findhorn EcoVillage Community, NE Scotland, within easy reach of Inverness and Aberdeen airports. The Community is a major international centre for personal and spiritual transformation and sustainable living. It is situated on a 2-mile long peninsula amongst beautiful beaches, sand dunes and woodland.